The basis of learning is the quality of training that is provided to the student. What a student learn reveals what a teacher has taught. The success of a student majorly lies in the hands of the teacher and the training provided by him. Master Mind Abacus being the educators, who shape the futures of kids, believes in delivering quality training to students. Our perfect training solutions through exclusive course materials, advanced technology and innovating teaching methods have always ensured that students gain the most out of our Abacus program. · Introduced unique teaching methods like score board and point card that involve active and longer participation of students. Want to take the best brain development and mental arithmetic solutions for your kid? Enroll him/her for the Abacus course at Master Mind. Very nice blog & useful information for visitors.thanks for visitor. what site to find out more about a franchise? Thanks for sharing this Article. This is really very useful for whose searching for Abacus Classes information. I hope you do more articles like this in the Future. Well said Isha, there are lots of institutes who provide abacus training classes for kids and mastermind being one of those. 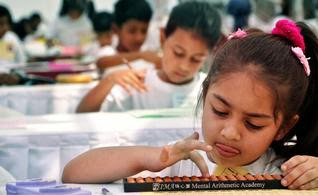 Children can only learn abacus properly in an institution under the proper guidance of experts.